I’m a huge fan of both two-player games and cooperative games, so I was pretty pumped to do this The Ravens of Thri Sahashri review. I don’t know what I expected from this game, but I was surprised to find out how different it was from everything else I had played. Was that a good thing? Read on to find out! What is The Ravens of Thri Sahashri? 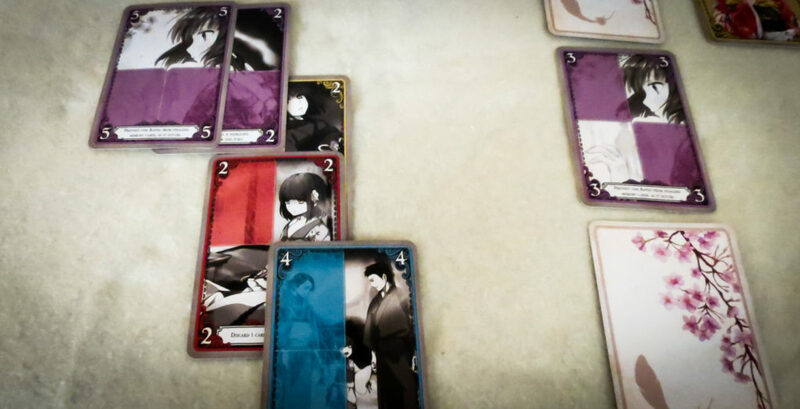 The Ravens of Thri Sahashri is a two-player cooperative card game unlike any other. One player will be Feth, who is hoping to help the second player, Ren, restore her heart and wake her up from her coma. The Feth player will try to do so by piecing together past memories while trying to keep those memories from being eaten by ravens. As is the case with most cooperative games, there are plenty of ways to lose, but just one way to win. 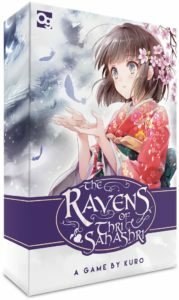 The Ravens of Thri Sahashri was designed by Kuro and published by Osprey Games. The rules to The Ravens of Thri Sahashri are a bit more complicated than we expected them to be. We’re not going to go over all of them here, but you should end up with a pretty good feel for how the game plays. When playing as Feth, you will be drawing memory cards, adding any of those cards to the Atman in the middle of the table, and then discarding the rest of them. When adding to the Atman, you will try to make like-colored memories equal seven, which will relive one of Ren’s memories (she will reveal one color from her row of cards). Some parts of the memories are shattered and some of them are clear, so matching up the cards is a bit more difficult than it sounds. When Feth draws a raven card, that card is put aside and stays in play. Any discarded cards of that color go beneath the raven card (the raven “eats” the memories) and don’t come back into play in future rounds. The only way to remove that raven is to relive a memory of that color. When you take on the role of Ren, you will have four cards in front of you. Your goal is to try to complete the “poem” in front of you by making a “rhythm” of cards. To complete the poem, you need to have the four rows of cards equal 7-7-7-5. After Feth has taken his turn, Ren will take one of the cards from the Atman and add it to the poem. This will give Feth a clue about what card colors and numbers he should be going for. The overall goal of the game is to work together to figure out what cards the Ren character is holding. If you can get through three poems (rounds), then you will win. You lose if all five ravens are on the table at the same time; Feth can’t put a card in the Atman; the Atman has no cards in it; no cards are remaining at the beginning of a round; or if the Atman’s colors do not match Ren’s heart at the end of the final round. If you want to read more about how to play The Ravens of Thri Sahashri, take a look at the official rules (PDF). We always give credit to game designers when they bring something new to the table, and Kuro definitely did that with The Ravens of Thri Sahashri. We recommend reading through the story in the beginning of the rulebook to help you get into the theme. Even though you can’t really talk to your partner in this game, you have to work well together if you want to win. The person playing Feth will need to play cards that their teammate can do something with, and the Feth player will need to be able to place those cards in a way that tells their teammate what she needs. It has very cool back-and-forth teamwork. Even if you are not into the anime-style artwork in this game, chances are you will still love the art on the cards. They did a fantastic job of making the cards look like memories, which definitely helped us get into the theme. If you can’t get into the theme of The Ravens of Thri Sahashri, chances are you aren’t going to like it. While that’s true of a lot of games, it’s especially true here because the experience is as much about the theme as it is the gameplay. 10 people in our group played this game and four of them did not like it after playing as the Ren character. They did enjoy it after switching characters, but I’m sure a lot of people will dislike playing that role enough to never play the game again. The Ravens of Thri Sahashri is not a game that everyone is going to love. In fact, many people won’t play it more than once. If you’ve read this entire review and you feel like the game won’t be for you, chances are it won’t be. However, if the theme interests you and you like two-player cooperative games, then you could end up liking this one a lot. Even though some people in our group didn’t have as much fun when playing as the Ren character, most of us think it is a really solid game. We’ve enjoyed the story, the artwork, and how the deduction mechanic was implemented. It’s one of those games that we’ll keep because it is so different than everything else on the market. Thanks for taking the time to read our The Ravens of Thri Sahashri review!